In his presentation on Tuesday, Savage caught the attention of attendees when he noted that his team of researchers were able to control a vehicle by playing a song with malicious code encoded in one of the tracks. “Basically, give me 18 seconds of playtime and we can insert the attack code,” Savage told a reporter from the UK publication The Register. 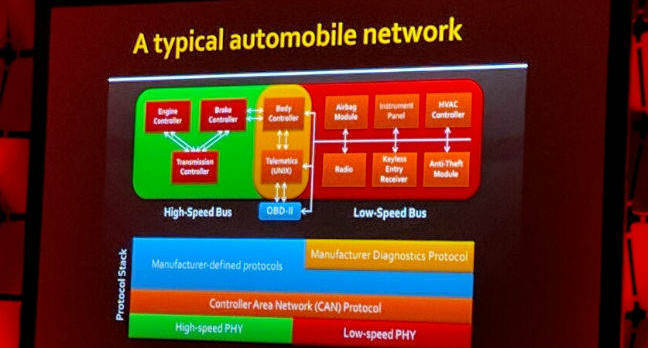 Savage said that specific flaw has since been addressed, but automobiles remain vulnerable because automakers use a government-mandated OBD-II port, which opens up the car’s network. “For cars, the original equipment manufacturer is not the developer, they are the integrator, so there are software supply chain issues,” he said. “Source code is frequently not available, so code inspection does not work, since no party in the world has access to all of a car’s source code. Read the news article in The Register.